Gadi Eshed is a veteran Israeli Police intelligence and investigations officer. He retired in October 2016 after 37 years of service. During his police service, he and his teams were involved in solving complicated investigations. Gadi led some of Israel's largest police field operations. He has vast experience conducting hundreds of investigations, solving murder cases, conducting investigations into trafficking of women, international drug dealing, severe violent crimes, money laundering and organized crime. Gadi commanded Tel Aviv's elite Central Unit for 5 years. The unit leads Israel's fight against serious crimes. Gadi's commanding and operational experience lead him to publish nine academic articles. Four of his articles have been published in prominent law reviews and have frequently been referred to in judiciary decisions including Israel’s Supreme Court decisions and the High Court of Justice of Appeals for the Military Forces. Gadi also served as head of the police's Research Department and Deputy Head of the Intelligence Branch. These appointments entailed information processing, analyzing and researching large volumes of information in order to extract relevant information and present it to the Police Commissioner and Israel’s Minister of Public Security. While serving in these positions Gadi published a police periodical reviewing law enforcement challenges and analyzing crime investigations and terror. 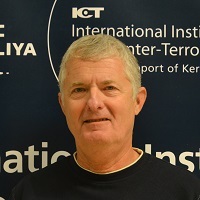 One-on-one with retired police commander, Gadi Eshed, Associate at the International Institute for Counter-Terrorism (ICT) and former commander of Tel Aviv’s Central Unit.